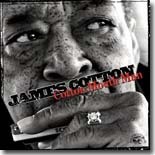 Harmonica legend James Cotton gathered a big group of supporting musicians and vocalists to put out the excellent Cotton Mouth Man on Alligator Records. It was an easy choice to be this month's Pick Hit. The late blues/soul crooner Lou Pride's last CD, Ain't No More Love In The House, is the Surprise pick this month. Thanks, Lou, for a great career. This month's Flashback looks at a very fine collection of piano blues from Wolf Records, with recordings from great pianists like Pinetop Perkins, Henry Gray, Big Joe Duskin, Mose Vinson, and others. Our What's New section features reviews of new CDs from Charlie Musselwhite, Eric Bibb, the underrated Billy Thompson, Harmonica Hinds, Sonic Blue, Charles Burton Blues Band, Nick Black, Downchild, Ursula Ricks, and more.